I’m an enthusiastic proponent of editing weddings and portraits with Lightroom Mobile on the iPad Pro, and I would estimate that I edit roughly half of my photographs this way. I get asked about it often by other wedding photographers on social media and in-person, so I figured it would be a good idea to put together some comprehensive information on the topic. Many of the articles and discussion online about LR Mobile revolve around the goal of using the tablet as a completely independent mobile editing solution while traveling, where images are imported directly into the device (connecting the camera or card reader to the Lightning or USB port) for editing with no computer involved. Because almost all of my weddings, portraits, and events are local, I don’t have a need for that kind of purely mobile workflow, and a totally iPad-based workflow would be cumbersome, inefficient, and impractical for the high volume of photographs that most wedding photographers need to import, store, make multiple backups of, edit, and export each week. So, this series of articles will be a discussion and tutorial about using the iPad in conjunction with a Mac or PC serving as the main workstation and centralized storage point for all the original RAW images, with the tablet functioning as an alternate editing device for those images, synced through Adobe Creative Cloud with Lightroom Classic running on the computer. This workflow is an efficient, practical, and easy to implement method for wedding photographers to edit images anywhere on an iPad. And once you try it, you'll wonder how you ever lived without it! Why Edit Wedding Photographs on an iPad? I was originally prompted to investigate incorporating the tablet into my workflow when I would sometimes find myself with many hours of downtime to kill during activities that my kids were involved in. For instance, when one of my kids was participating in high school honor band, the all-day rehearsals took place over the course of several days, at a college located about an hour away. Rather than drop her off and drive home, returning later to pick her up (which would have meant an extra two hours wasted in the car on each of these days), I would load up my MacBook Pro laptop with a wedding or two to give me something to work on while I camped out there in the auditorium (which also gave the added benefit of me being able to listen to the ensemble’s rehearsals). Having to manually move the images and Lightroom catalog files around was a bit cumbersome. And although Apple’s current lineup of laptop computers are more compact and lightweight, my MacBook Pro at the time was quite heavy and bulky in comparison. That’s when I stumbled onto Lightroom Mobile on the iPad, which I was aware of but never really paid much attention to. It was only after installing it and giving it a trial run that I discovered what a powerful and capable solution Adobe had made this app into over the several years since it had been first introduced. I was expecting only basic, rudimentary editing controls, but found it to be surprisingly complete (and it’s only gotten better since then). With a few small modifications to my normal workflow to facilitate the inclusion of the iPad by syncing my images to Creative Cloud, I now had an easily portable and fully capable secondary editing station that I could grab and go whenever the need arose. This has been nothing short of revolutionary for my wedding photography workflow. Because the manual steps necessary before and after mobile editing are so minimal, a significant barrier is removed. While exporting a catalog and RAW files from Lightroom and copying to a laptop (and then re-importing the edits back to the main computer afterward) is not a major hindrance in the context of a scenario where you’ll be away from your desk all day (or a number of days), to me it’s simply not worth bothering with to make use of just an hour or two here or there. The iPad synced with Lightroom Mobile overcomes this barrier. The only major caveat is that this is only an efficient solution if you don't frequently need to make the trip into Photoshop with your images. The reason is, as will be discussed later, with this workflow your iPad will only have Smart Previews (which are reduced-resolution RAW proxies) available, meaning even if you have a suitable photo retouching app on your iPad, you won't have the high resolution image data to work with. You can, of course, simply mark (with Stars or another method) any images that need additional Photoshop, and take care of that work back on the computer. As long as you follow the workflow suggestions given later (particularly employing the "Store Locally" option), an internet connection is not required while editing on the go. Any edits you make while not connected will simply be synced to the server when you regain connectivity. Kids’ activities. This is obvious a bit of a gray area for parents, one that you should be careful about finding the right balance for you. If I’m taking my kids to the playground or a birthday party, I’m not bringing my iPad, as I enjoy simply watching them play, and by no means do I consider to that to be wasted time that would be better spent working. But for things like music lessons and rehearsals, soccer practice, etc., where the standard procedure for most of the parents is to drop them off and pick them up afterward, I prefer to stay and listen/watch, while also being able to get some work done. Another good example is when one of my kids was heavily involved in competitive dance. These competitions would last for multiple days, often with gaps of several hours in between the dances she would be performing in, giving me a lot of down time. Travel. You can edit while on a plane, or while traveling by train, bus, or car (as a passenger, of course!). Time in between meetings or shoots. I’ll sometimes find myself with a gap of a few hours in between client meetings and/or portrait sessions. And though I try to construct my scheduling to avoid such gaps, in some extreme cases I'll have a meeting in the morning, and then another meeting or an evening in the late afternoon or evening. Rather than wasting time and gas driving all the way home, only to have to hop right back in the car and drive back into town a little while later, I can sit in a coffee shop or the hotel lobby and get some editing done, productively using this time just as I would if I were home. Pre-Wedding Cushion Time. I always plan to arrive early at my first location, which often results in me having an extra hour or so of time before I'm scheduled to start my coverage. I don't usually bring my iPad along in these typical instances, instead opting to use that time to do final preparations of my equipment, scope out the venue, or just relax for a little while before I start shooting. But there are days when I feel compelled to leave myself a much larger amount of buffer time due to external factors. For example, if particularly horrendous weather is predicted at the time I'd normally be driving in, I might weigh the option of leaving several hours earlier than I ordinarily would, just to avoid traveling in those hazardous conditions. Or if I learn that there is a big event going on in the city that could produce unusually heavy traffic and parking issues, I'd prefer to get in there early rather than struggle with these difficulties. Knowing that I can bring my iPad and work from there just as easily as I can from home for those extra several hours makes these kinds of situations easier to deal with, as it removes the anxiety of wasted time from the decision. Waiting rooms. Ever lament the fact that you so often lose many hours of your precious time just sitting in waiting rooms with nothing to do but play games on your iPhone, read old magazines, or watch those dreadful daytime TV shows? Whether at the car dealership having your vehicle serviced, spending half the day at the DMV, or waiting in the doctor's office with a dozen other patients who, curiously, all seem to have been given the exact same 10:00am appointment time as you, this time can be utilized productively with your iPad and Lightroom Mobile. Similarly, I donate blood regularly (a process which takes about an hour and a half), and I always bring my iPad along so I can work instead of just laying there watching television or killing time on Facebook. Now, I’m not suggesting that, just because you can, you should walk around drone-like with an iPad glued to your hand all day, editing photographs during every waking moment, at the expense of time spent with family, recreational activities, or simply maintaining your own sanity. But let’s be realistic. Sometimes the editing backlog can stack up, especially during the busy times of the year for weddings. For those of us who do not feel comfortable outsourcing our editing, in order to be fair to our clients and deliver their images in a reasonable amount of time, sometimes we need to put in longer working hours during the rest of the week than we normally would. And even during the non-busy periods, I personally hate wasted time – editing on the iPad, to me, is all about productively utilizing those chunks of time. LR Mobile also can be installed on an iPhone, and is similar to the iPad version in terms of feature set. All of your synced images will appear, and any changes made will be synced back to your other devices as well. This can be handy if you unexpectedly find yourself with some dead time while away from home and you don't have your iPad with you, though if you don't have an unlimited data plan, keep a careful eye on your data usage if you're away from WiFi. While I can't vouch for other iPhone models, I've found the display of my iPhone 8 Plus to be color-accurate, a near-perfect match with my iPad Pro 12.9" (the recent FaceID model) and color-calibrated iMac Pro. However, the constraints that the relatively small screen imposes on the user interface can make it tedious and potentially frustrating to edit large numbers of images quickly and efficiently on it, so I don't even try. I do, however, on occasion use it for culling, making blog selections, and perhaps performing some initial rough edits on that small number of picked images. While the most notable and obvious benefit of editing weddings and portraits with Lightroom Mobile is with enabling photographers to be productive when away from their desk, I also frequently use it by choice even at home when my desktop computer is available. Though I can edit a bit more efficiently and quickly in Lightroom Classic on the computer, it’s not as big of a difference as you’d think, and I can work almost as fast on the iPad in most situations. As a result, if I’ve been sitting at my desk for several hours editing photographs and just need a change of scenery and a different position for the sake of reducing fatigue, I can grab the iPad, kick back on the couch, and continue right where I left off without giving it a second thought. Then when I’m finished, those changes will have been automatically synced to the cloud and back down to the computer, where I can set up the JPEG export and upload to the gallery. Another benefit of this workflow is that it also enables you to keep editing even if approaching thunderstorms prompt you to shut down and unplug your computer out of fear of damage from a lightning strike, or if your home or studio loses power. 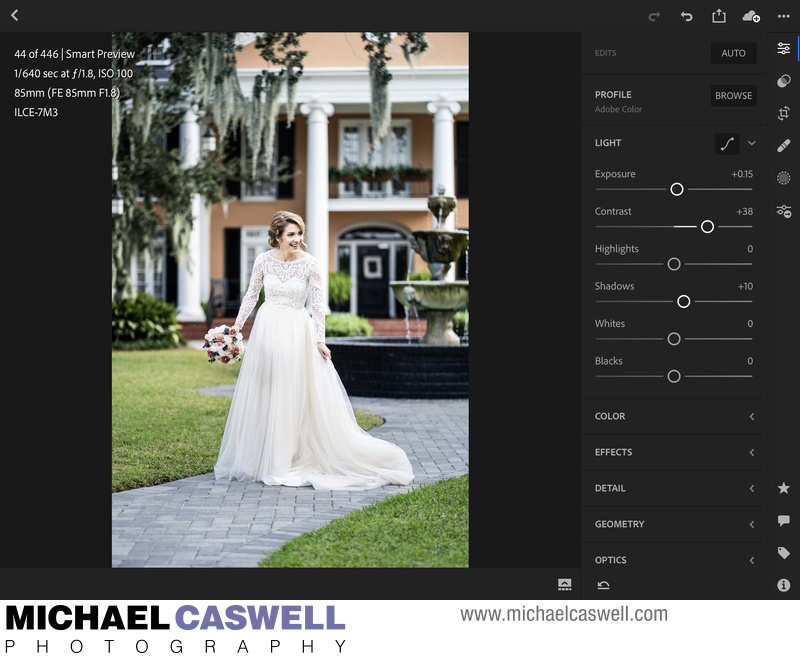 For photographers who have multiple people editing in-house, a Lightroom cloud-synced workflow can also serve as a workable option, eliminating the need to manually move images and catalog files around or to have to keep track of where the latest version is. My wife does much of our editing, and while our previous solution of shuffling jobs back and forth on a flash drive was ok, the current method is notably easier. I simply tell her which of the currently synced weddings she should work on next, and she tells me later when it's done. My computer, running Lightroom Classic, serves as the main workstation that houses the original RAW files, while she works on her computer using the cloud-based Lightroom CC (more on that in the next section), and then we both use iPads as well. While there is a limitation that only one person at a time can access a Lightroom Classic catalog file, that does not apply here, as the cloud-based clients (Lightroom CC and Lightroom Mobile) are not directly accessing that catalog file, but rather are syncing the images and subsequent edits back and forth through the Creative Cloud server, with any changes made to an image getting synced to all other logged-in devices. It's also worth mentioning that this main computer does not need to be powered on all the time in order for this workflow to function. The other devices are not communicating directly with that computer, but rather are sending their changes to Adobe's server, and do so completely independent of the main computer. If that machine is shut down, the next time you start it up and open Lightroom Classic, edits made on the other devices will be synced to it. I do personally leave my iMac Pro on all the time, set to never go to sleep (though I do allow the display to go to sleep), as I have it set to run automatic backups overnight. Because of this, I usually just leave Lightroom open on that machine so that when I do choose to use it, it's all synced up and ready to go. The next section gets into the details of how to implement a Lightroom Mobile workflow.